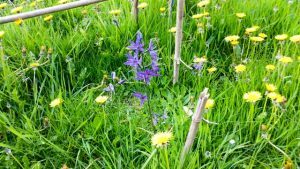 The MCGO Camas Project blooms a little more. 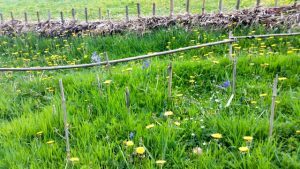 A protected temporary fence (permaculture term ‘waddle’) safely shields the new blooms. The goal is to have a profuse display of ‘blue’ covering a very wet terrain. This being the first bloom/planting, the plan is to increase planting and support the existing plants. The location resides east of the Fig Orchard and near the trail entrance, along the North Orchard. With the trail upgrade in progress, it will be a nice view, once established. Several years ago, willows were planted north of the existing blue camas plantings, with the intention of not only sucking up some the ground water but also, becoming a secondary use, with an eventual source for basket weaving at the Community Center. Every season MCGO tackles a new challenge or adds a new element to Community Garden and Orchard. As a resource to educate, feed or share, the site is more than a dog walk location. All ages visit MCGO and the effort to inspire and engage users to realize the opportunity to expand knowledge and practice is working here. The hope that planting, sharing and inviting will increase the strength of community in Seattle is now in its sixth season. We continue to grow the opportunity.